Seed ordered from a seed catalog will be much fresher than seed in the rack at a local retailer. None of the following companies sell Monsanto/Seminis seeds as far as I can determine. Most of them have signed the 'Safe Seed Pledge' which forbids genetically modified seed. Others go farther and sell only organic or open-pollinated seed. BOUNTIFUL GARDENS; 18001 Shafer Ranch Road; Willits, CA 95490; 707.459.6410 www.bountifulgardens.org This is a good source for open-pollinated seeds and often have varieties not found elsewhere. They also sell packets of grain seed – grow a little wheat, some oats or rye? Don't dismiss this out of hand – I had a wheat field in my front yard once. It is a good thing to support organizations that do credible garden research. 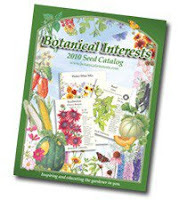 FEDCO SEEDS; PO Box 520, Waterville, ME 04903; 207.873.7333; www.fedcoseeds.com A very funky catalog, that makes me think of the Trader Joe's Frequent Flier, provides good quality open-pollinated seeds. While their focus is on 'cold-hardy, short season' seeds, we can use a lot of them here. As of August 31, they will no longer take orders for 2009. They begin to prepare for 2010's growing season. Their prices are low and the seeds are open-pollinated. A good deal for lots of seed. PEACEFUL VALLEY FARM SUPPLY; PO Box 2209; Grass Valley, CA 95945; 916.272.4769 www.groworganic.com A fair priced purveyor of more than just seeds. This is the company to order cover crop seeds and tools as well as veggie and flower seeds. Their catalog is so chock full of data on pest control, fertilizing, cover crop seeds and irrigation; I have used it as a text in my organic gardening classes. NATIVE SEED/SEARCH; 526 N. 4th Ave. Tucson, AZ 85705; 520.622.5561; www.nativeseeds.org; Like Seed Savers Exchange, this is a non-profit organization that exists to save seeds that have been grown for generations and represent a genetic diverse collection that mankind cannot allow to fall into obscurity. Their efforts are centered on the Native American seeds of the desert climates of Arizona and upper Mexico, which, despite the challenge of desert conditions still represent a disproportionate portion of our modern food crops. PINETREE GARDEN SEEDS; PO Box 300, Rt. 100; New Gloucester, ME 04260; 207.926.3400 www.superseeds.com This is the least expensive catalog of all. How? The packets are smaller with fewer seeds. And that makes good sense for us with smaller sized gardens. If I want more, I can order more packets – but usually I order several varieties with which to experiment. 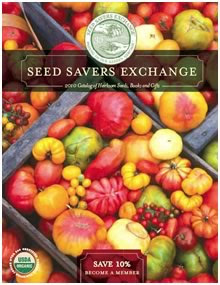 SEED SAVERS EXCHANGE; Rt. 3 Box 239; Decorah, Iowa 52101; 563.382.5990 Membership fees $35. Free brochure. www.seedsavers.org This is the other main source of seeds for me. I have been a member for over five years because I believe in the work they do saving the rich heritage of heirloom seed varieties that might well be a thin green line between us and the Monsanto's of this world that are striving to control our food supply. I urge you to order from the Exchange and to become a member; we NEED these seeds.